Shredded rotisserie chicken or beef tops homemade tostadas in this Tex-Mex favorite. 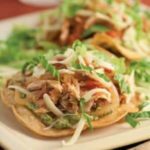 Making your own tostada shells from fresh corn tortillas is easier than you might think—crisp them up in the oven while you prepare the toppings. Choose either regular petite diced tomatoes or those with added jalapeños, depending on your inclination for spicy food. You can also put a thin layer of refried beans on the shell first, then the salsa with meat. Serve with black beans, rice and extra salsa or hot sauce on the side. Position racks in the upper and lower thirds of the oven; preheat to 375°F. Bring tomatoes and their juice to a boil in a medium saucepan over medium heat. Add onion and cook, stirring occasionally, until the onion is soft and most of the liquid has evaporated, 15 to 20 minutes. Add turkey, chicken or shredded beef and cook until heated through, 1 to 2 minutes. Meanwhile, coat tortillas on both sides with cooking spray. Divide the tortillas between 2 large baking sheets. Bake, turning once, until crisped and lightly brown, about 10 minutes. Mash avocado in a bowl. Stir in salsa, sour cream and cilantro until combined. To assemble tostadas, spread each crisped tortilla with some of the avocado mixture. Top with the turkey (or chicken) mixture, lettuce and cheese. Alternate instructions, separately warm onions and tomatoes, then top with cooked and seasoned meat. Costco rotisserie chicken and pressure cooked chuck are good choices. Frozen avocados (bag of 12) already pitted and ready to go are available at Smart and Final. See the instructions on this site.